Many mayflies that hatch as light green or olive duns turn into spinners of the same general shades. Trout can be very picky when feeding on spinners. Especially when feeding in scum lines in slow back-eddies, trout normally find that one type of food is preferable to all others. It is always best to spend a lot of time observing your quarry before making that crucial first cast. Then you must be very precise in your fly placement in front of the fish. Putting your fly exactly in the center of a fish's feeding lane is often as important as having the right fly pattern. Organza is a thin, sheer fabric traditionally made from silk. Many modern organzas are woven with synthetic filament fibers such as polyester or nylon. Traditionally a fabric used to make brides and harem women more attractive, organza has found favor with fly tyers for several applications, such as the clear spent wings of mayfly spinners. The fabric is cut in narrow strips with the fibers running parallel, then the strip is tied crosswise of the hook. After the rest of the fly is tied, the cross fibers are easily picked out to leave only the fibers that were tied perpendicular to the hook. These clear crinkled fibers are lightweight and when treated with floatant, will support the fly on the surface of calm water. 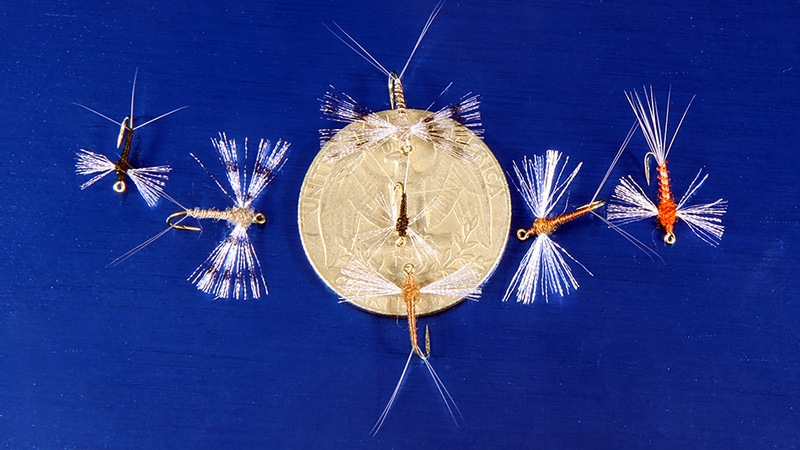 The crinkles in the fibers give a sparkly effect just like real clear mayfly spinner wings. Organza fibers have become the most popular material for this application.